"The Human Performance Game is changing. Would you be interested in receiving a 17-minute presentation of the Critical Human Performance ANSWERS that actually drive human results? See it here!" Employee performance is NOT a single measure. It is a performance matrix comprised of 4 major integrated ingredients. We've identified those ingredients and we offer the validated instruments that can measure those factors ... and best of all, we've integrated those factors into a reliable performance answer that provides our clients with "the making great people decisions insights" they really need. "Give me an ANSWER ... not more pages of data that I have to decode!" The Bus Concept Performance Zone Technology is built upon the Nobel Peace Prize nominated research of Dr. Robert S. Hartman. This amazing work has been carried on by Wayne Carpenter, who was one of Dr. Hartman's graduate students at the University of Tennessee. Wayne has spent 30 years scientifically expanding, validating, and translating Dr. Hartman's revolutionary discovery into modern business models. His tireless effort has validated the ability to precisely measure the individual human thinking patterns that drive all decisions, and he has built that understanding into these reports. He confirms Dr. Hartman's contention that while all human beings Value Reality using the same 3 dimensional STRUCTURE OF VALUE, we each adjust our valuation of reality using our own unique combination of the Clarity, Personal Bias, and Balance that we bring to the decisions we make. Thanks to Wayne's 30-year quest for excellence we can offer you accurate predictive performance information based upon the precise measurement of the unique thinking pattern of any candidate or incumbent. Our Success is directly tied to the QUANTITY AND THE QUALITY OF THE DECISIONS WE MAKE! What makes it Unique and Why does it work? Every action is first preceded by a DECISION to take that action. This technology scientifically measures the components of the decision making process translated into the net performance you can expect. The root cause of performance is, of course, the CHOICES WE MAKE. Measure the quality and quantity of the choices…and measure the performance prediction with stunning reliability. Listed below are some of the tools we could use to improve employee performance in your organization. If the reports shown do not meet your specific needs, please contact us. We may be able to generate other reports that assist in addressing what is important to you, what concerns you and what frustrates you in regards to employee performance. For additional information, please contact me at Dnbeard@roadrunner.com. 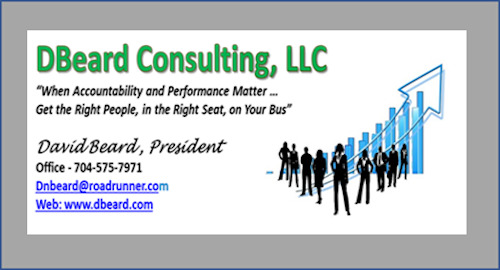 The above represents a portion of the tools we use to improve performance in your organization. If the reports shown do not meet your specific needs, please contact us. We may be able to generate other reports that assist in addressing your performance issues.